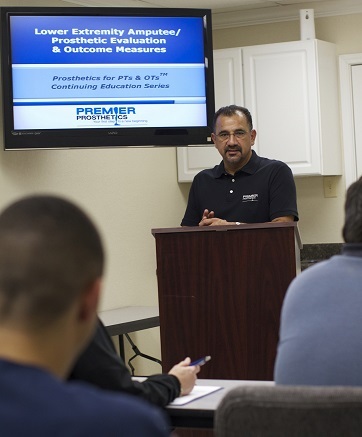 Premier Prosthetics provide continuing education to therapists, physicians, and patients. Our purpose is to strengthen the rehabilitation team that has the privilege of working with our patients who have undergone limb amputation, as well as to help our patients and their caregivers become better informed and more confident about living with a prosthesis. The key to providing the best patient care is education and training. Premier understands your time is valuable and may also be limited; Premier can arrange a session that will accommodate your busy schedule. Please contact Premier Prosthetics to schedule a session. Classes are available at your facility or at our comfortable Education Center.